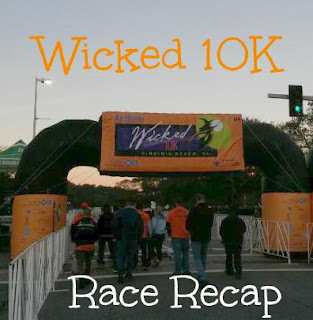 Running Wicked is one of the fun runs that I always look forward to. This year I wanted to do it but I was having trouble finding someone that had off work to be able to run with. One of my friends volunteered herself and said she would, but said, “I am much slower than you, so I don’t know if you’d want to run with me.” I replied back, “what’s the point of a fun run if you are running by yourself?” Of course I would stay with you. So that settled that, we would be running the Wicked 10k together. We were discussing what outfits we wanted to wear because we did want to match, but when it came down to it we decided we did not want to spend money on silly costumes we would never where again. We went through one my friend’s Halloween boxes to see what our options were. It was almost like going to the Halloween store, she had so many. We found ones that fit each of us and called it a day. The morning of the race, parking was very easy at the Convention center (not like Rock n Roll). I met my friend with plenty of time to spare. This was her first 10k so I was super excited for her. Her only goal was to not walk any of it. I told her if my pace begins to get too fast to please tell me and I will slow down. We started at a good pace, but then we eventually slowed down. I kept asking how she was doing and she would give me a thumbs up and we continued on. Throughout the race there were cheesy signs that where up, such as Why didn’t the skeleton dance at the party? And a few yards ahead the next sign would say because he had No Body to dance with. We were almost at the half way point and she said she might have to walk because she was getting a side stitch. At this point I was feeling bad for her because I know what that’s like. A few minutes later she said she was feeling better. But about a mile later she wanted to walk so we did a few blocks so she could catch her breath, and then we were back off. We were turning on the boardwalk at this time where there was about a mile left and they were handing out Krispy Kreme donuts…..yes please! I normally wouldn’t take that in a race, but heck I wasn’t racing it so why not. It was only a piece anyway. My friend looks at me and I could see it on her face like how are you eating that right now? Another half a mile down the boardwalk they were handing out candy corn. I kindly passed that up(I just hate candy corn). I could finally see the finish line so it was appropriate to tell her not much longer, we are almost there. I hate when people say that a mile into the race when clearly we are not almost there! 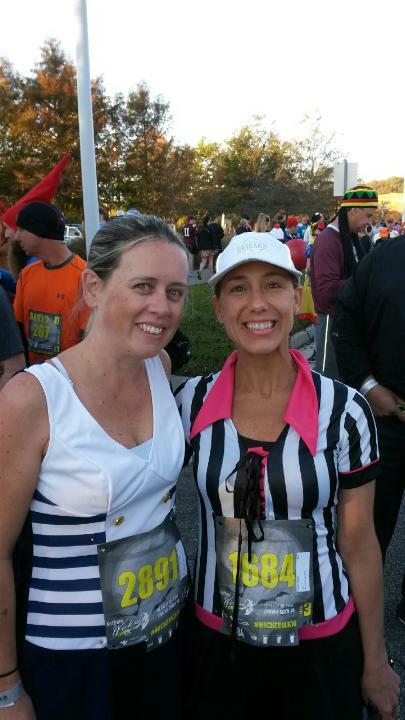 We both crossed the finish line with smiles on our faces but happy to be done so now we can enjoy the after party. Usually I am “racing” at races and I am so exhausted by the end that I grab a quick picture and I am on my way back home or to the hotel. 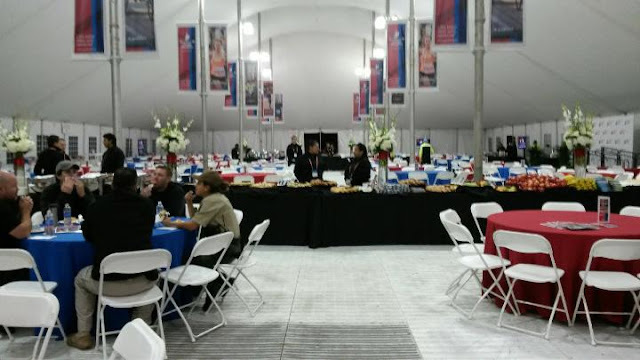 I never seem to stay for the entertainment for after the races. But this time it was different. She said her husband was in charge of taking all their kids to their games this morning so she could stay here and have fun! J&A Race Series really know how to put on a good race. 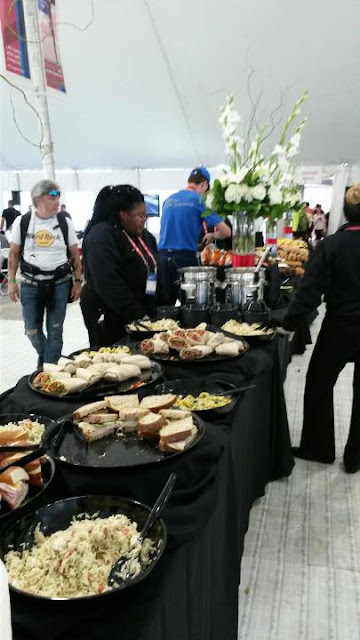 There is always a great band, finishers swag, and food and drinks. 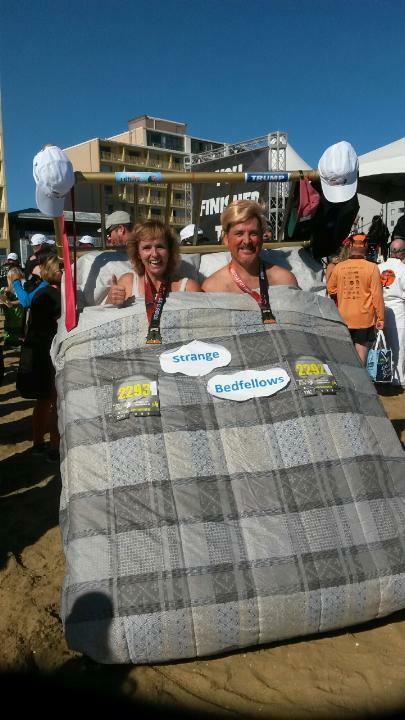 These folks won the costume contest. Rather than recapping my week( which was very uneventful) I am going to recap my weekend. Friday I had to teach RPM class in the morning then I had to work the rest of the day. I was happy to have gotten off at a decent time because the following morning I planned to run the Wicked 10k(recap coming). Saturday morning I got up very early to run the race. When I came home after the race, I actually took a nap because I had plans that evening to go to a haunted house. Every weekend in October my friend and I have been going to different Halloween events in the area. Last weekend we went to Hallow Screams in Busch Garden. This week we took a tour on the Nauticus in Norfolk VA that had an Alien Theme. It was ok but I thought they could have made it a bit scarier. It wasn’t too late when we finished so we thought we would look up other haunted houses that were close by. We came across Haunted Acres. It sounded good, but we thought it was a bit odd because it was in a strip mall that was just rented out for the month. We waited two hours in line for this. I thought to myself this better be good. And let me tell you, it did not disappoint. The reason it took so long was because they were only letting groups of 3 and 4 go in at a time so they could get the full affect. We were warned that the actors were even able to touch you. We went through several rooms in this haunted house and each room the actors did a little skit. After the last room(which we didn’t know was the last room at the time) we were told to crawl through this tunnel not knowing what was waiting on the other side. When we stood up it was pitch black and we could not see anything. We realized it was maze and we were on own to figure how to get out. I felt like we were just going in circles and running into other people that were trying to figure their way out as well. Finally after what we thought took forever, we found a door that looked like just a wall but pushed on it and lucked out. We were finally out of the maze. We were the only ones in our group that figured that out. Of course we were super quiet and didn’t say anything when we found the exit. I wonder how long those other people took to figure it out. I think it was one of the best Haunted House we have been to during the season and it was worth the wait. The next day I slept in and when I finally got up and around I thought I would go for a longer run because I didn’t have any plans until later that evening. I was hoping to do something in the double digit range. Last week I did 10 miles and I only had one of my water bottles filled in my hydration pack and I could have used both of them, so I made sure I filled both of them up and threw some pretzels thins and gummies in my pack and I was off. Do you celebrate Halloween? 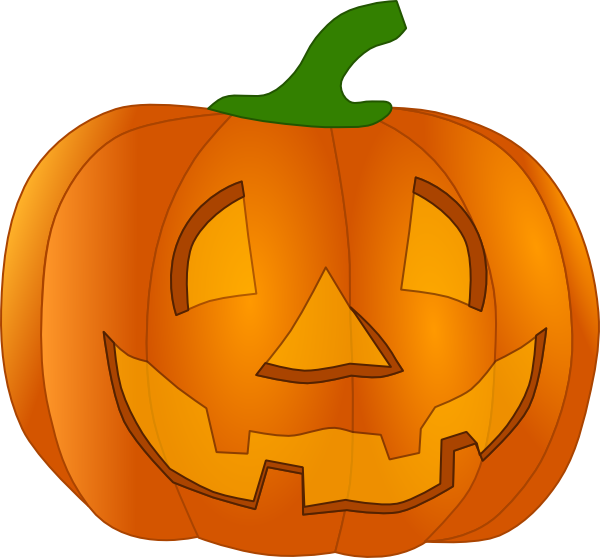 Do you carve Jack o lanterns, decorate your house, or even make Halloween themed foods? To tell ya the truth, I've never been a huge fan of Halloween. 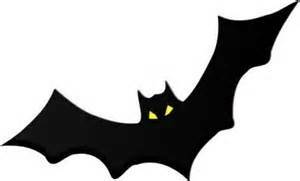 I don't like scary things, ugly things or being in the dark...lol. 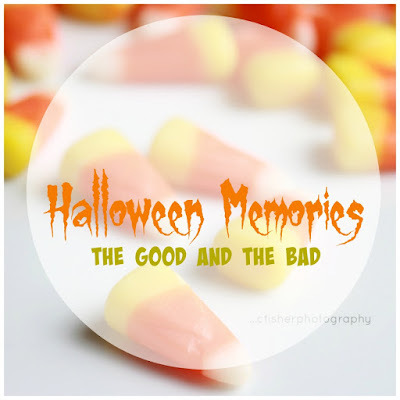 I thought for this Friday Five I would share a few fun (or funny) memories I have about Halloween. 1. I'm going Waaaay back to kindergarten for this one. It wasn't a fun memory but looking back now it's kind of funny. On Halloween our teacher made us color a picture of a Witch face. 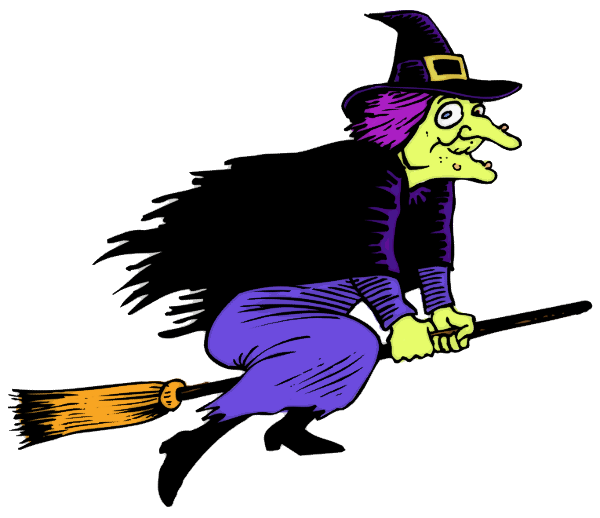 In my mind when I see a witch, I think of the witch from Wizard of OZ, so for this reason I colored the witch face green (on purpose). I may have mixed two colors together to get green. ( This was 30 years ago so I don't remember why I did this. Perhaps we only had the three primary colors of crayons, I don't know..lol). Anyway, the next day when I got my paper back I got an unsatisfactory mark and a note that said "I know you can do better than this". I was very good at coloring so this note clearly upset me. I thought I was being clever by coloring the face green! 2. Our grandmother, we called her our Mammy (bless her heart) LOVED Halloween. She would dress up in costume (usually something ugly or scary) and come trick or treating at all the grandkid's houses. One year we had no idea who she was. Even my parent's didn't know it was her. Finally my sister pointed to her shoes and said "it's Mammy", I know because I recognize her white Reeboks. 3. My very first "real" race (meaning a timed non Disney race) was the Monster Mile. The race took place on the boardwalk. I remember being passed by all these little kids. I felt bad because I even had to stop and walk a bit half way through it..haha. I finish in 10 minutes flat. Afterwards we had to prepare for what was one of the largest Hurricanes on the East Coast. 4. One year I was at my parent's house for Halloween (cus we don't get trick or treaters at my house), A trick or treater with a Golden Retriever came to the door. The retriever was dressed as Sponge Bob Square pants. Her name was Felicity. Ten years later (which was this past Spring) I met a golden retriever at the park I run in and the owner told me her name was Felicity and she was about 11. I remembered the name Felicity and asked her if Felicity ever dressed up as Sponge Bob for Halloween and by golly she had. It was the same dog. It was nice to see Felicity was doing well. 5. 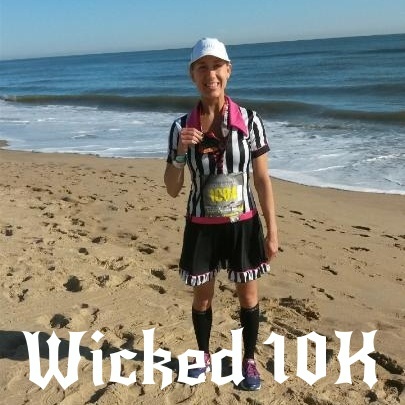 The last Halloween-ish memory was when I ran the Wicked 10K (in VA Beach) for the first time. 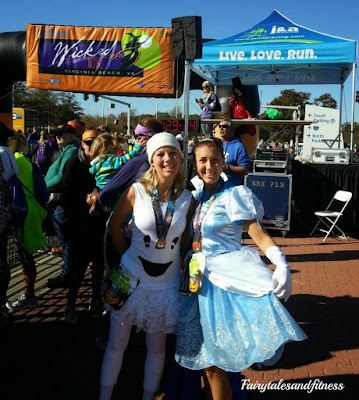 I dressed as a ghost and I PR-ed coming in at 58 something! I believe that was the last 10k I ever ran and that was over 3 years ago. I'm thinking I need to start finding some 10Ks! 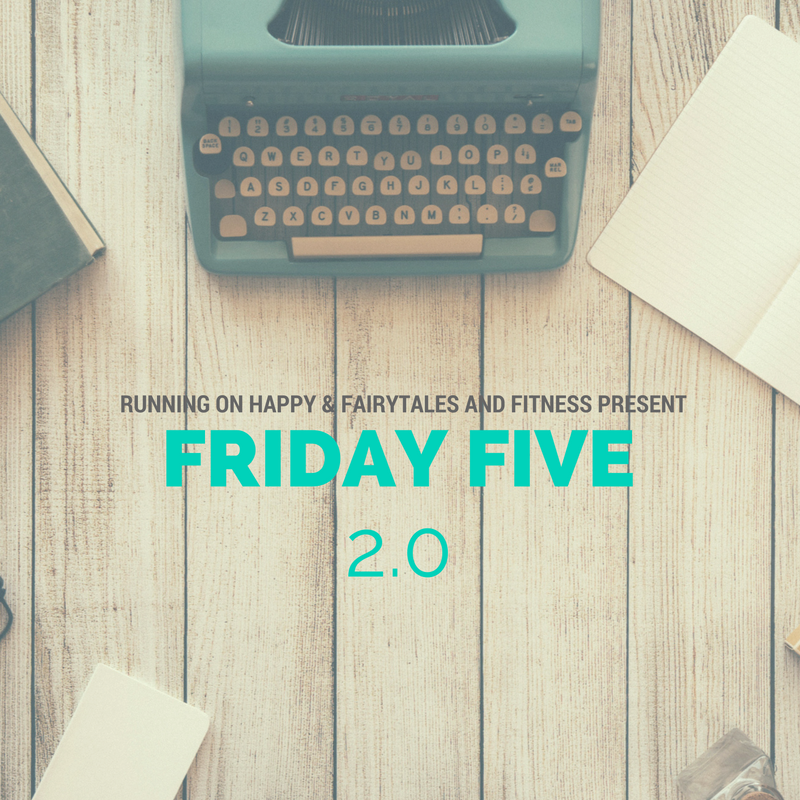 Join Running on Happy and Fairytales and Fitness every Friday for the Friday Five 2.0 linkup! Below are suggested weekly themes. We realize not everyone will be able to write on each topic. 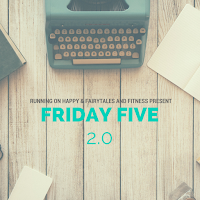 Feel free to linkup non-themed posts that follow the Friday Five 2.0 format. 11/4 – 5 Things About You — Give us a quick 5-thing run down of things people don’t know about you! Well, next week we will be in Disney for the Wine and Dine Half Marathon weekend. I honestly can't believe how fast time is flying by! I think we signed up for this race back in March, and like with any Disney race we started thinking about our Race Day outfits shortly afterwards. 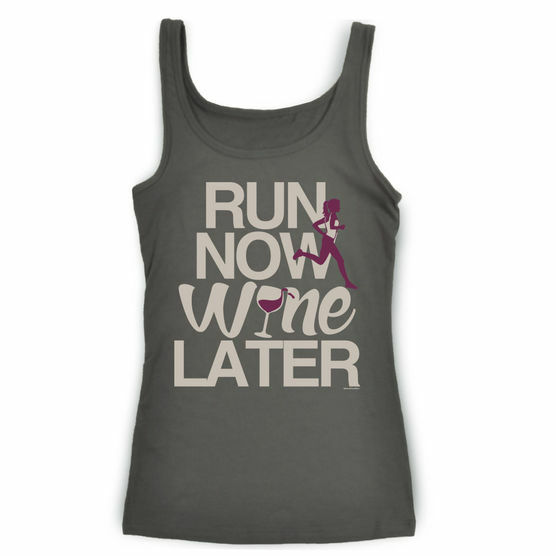 This one was a little challenging for me to come up with because neither one of us wanted to run in a "costume" yet we really wanted to stick with the Wine and Dine theme. However, most race shirts that I found that stuck with this theme looked like this. This is a nice top and all but I'm not a big wine drinker so I wouldn't feel comfortable wearing this. Besides, my sister and I are running as a team so we wanted shirts that would "match" or compliment one another. Just because I don't care for wine doesn't mean I don't like to dine! This is what we came up with. I know these aren't terribly creative but I think these tanks paired with the running skirts will make for a very comfortable race outfit. Do you find that there is a difference between how you SHOULD train and how you are ACTUALLY training? I am the first to admit that I don't ever follow a training plan. Yes, I should, but I just never made the time to look for one to follow. 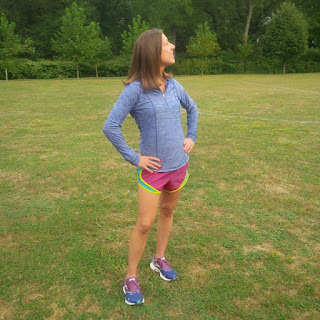 I read a lot of Runner’s training blogs and they get up first thing in the morning to get their run out of the way. I guess for most people that have a 9-5 job they want to just get it out of the way, because if they don’t do it then, it won’t happen. For me I feel like I am the opposite. Every time I force myself to get up early for a run, I feel miserable the rest of the day. I am so tired and don’t feel like doing anything, which usually results in napping the rest of the afternoon. So needless to say it does not re-energize me. The other day I slept in until 10:30am and it was lovely. I thought about going for my run but since I got this new watch I was told that there was an update that needed to be done. So I call Garmin. Of course wait time is up to 20 minutes……here we go! Finally I got through and told the representative my problem. We were on the phone for over an hour trying to figure it out. He claims that I need to do an update on my phone and I couldn’t do it while I was talking to him on it. I asked if he could call me back in about ten minutes just in case that didn’t work so I would be able to talk to the same person that knew what was going on. He tells me that he is not allowed but if I call back there are notes in my record explaining the problem and that anyone could help. So of course that did not fix the problem so I call back, and again another 20 minute wait. This time I called on a land line so they wouldn’t be able to use that reason again. I get someone new so have to explain my problem all over again. He tries to do some more updates but cannot seem to figure it out either. He then proceeds to say that this has been an issue with some watches and IT department has been looking into the problem and that if they find anything out they would call or email me back. I asked what the time frame would be, and he couldn’t give me an answer. During all this wait time while I was on the phone I did manage to clean up and dust my whole bedroom. After all this I didn’t even feel like going for a run, but I told myself I had to get out there. I finally got dressed(half the battle). I got my hydration pack out and grabbed my Ipod. 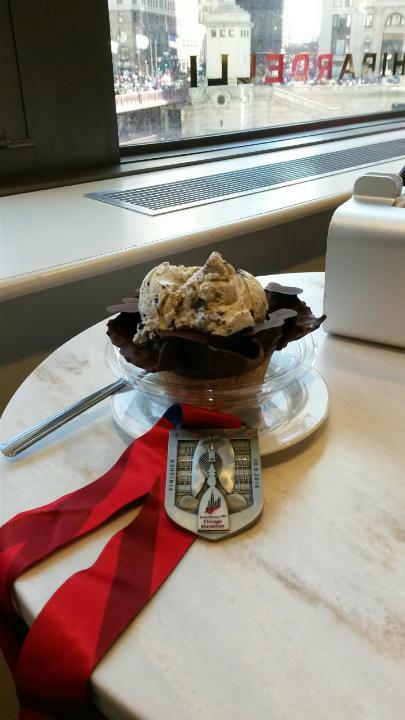 After getting everything ready for my run, I was hungry again. I kept delaying this run. After eating half of a power bar I was finally out the door about 2pm. The temperature was pretty warm, high 80s with humidity but I was going to get this run done! The night before I downloaded a new podcast from Another Mother Runner to listen to. Even though I am not a mother I can relate to their material. It is a great podcast and makes the time fly by. Before I knew it I was five miles in and knew my turnaround point was coming up soon. I filled up my water bottle at the fountain and ate the rest of my power bar before heading back home. I ended with 11 miles…score! I came home to find a missed call on my phone. It was from Garmin. I thought maybe they solved my problem, but why wouldn’t they leave a message? So I call back again and wait another 20 minutes to get someone on the phone. Of course I got a new person and had to explain my problem all over again. Finally it was fixed. By this time it was going on 6pm. Where did the day go? I’d like to think I had a productive day by getting my long run in, even when I did sleep in until 10:30. 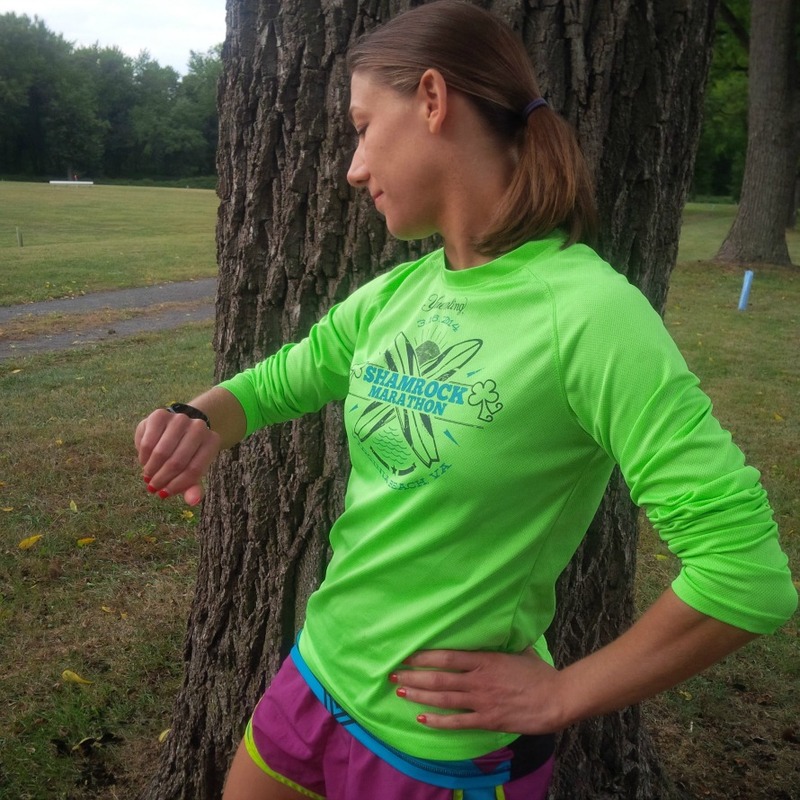 Would have you been able to motivate yourself to do a long run at 2 in the afternoon? Or would have you just thrown in the towel and say next time? 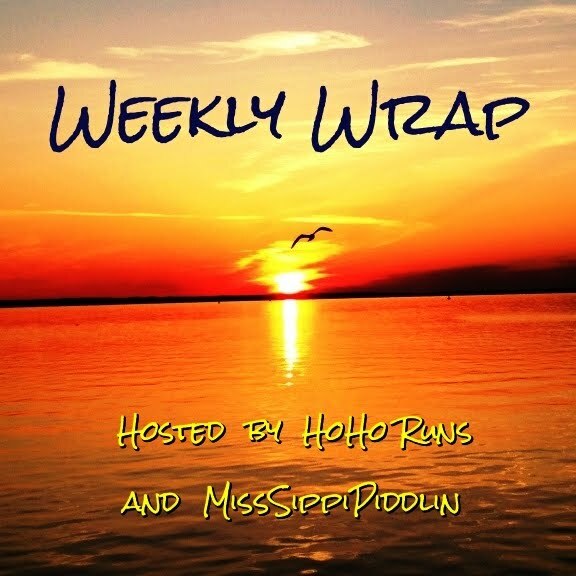 Welcome to the weekly wrap! 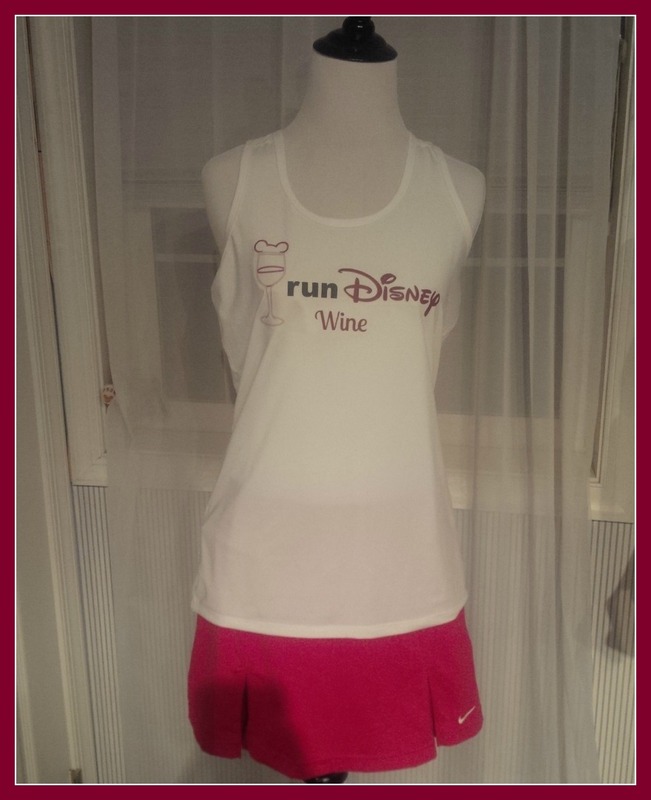 In exactly two weeks from now my sister and I will be running Disney's Wine and Dine half marathon. I don't even know if I am prepared or not but I am sure eager to get out there and run. As you know I have been dealing with the pain in my calf so I decided to rest for the past couple of weekends. On Friday my PT said it looked like my hematoma was healing nicely and to go ahead and try a run and see if I feel any pain. I may go out sometime today and try a little run or at least a run walk. On a side note, this past week has been absolutely beautiful! We've had weather in the high 70's and 80's which is unusual for this time of year. Kind of bums me out that I wasn't able to get out and run. 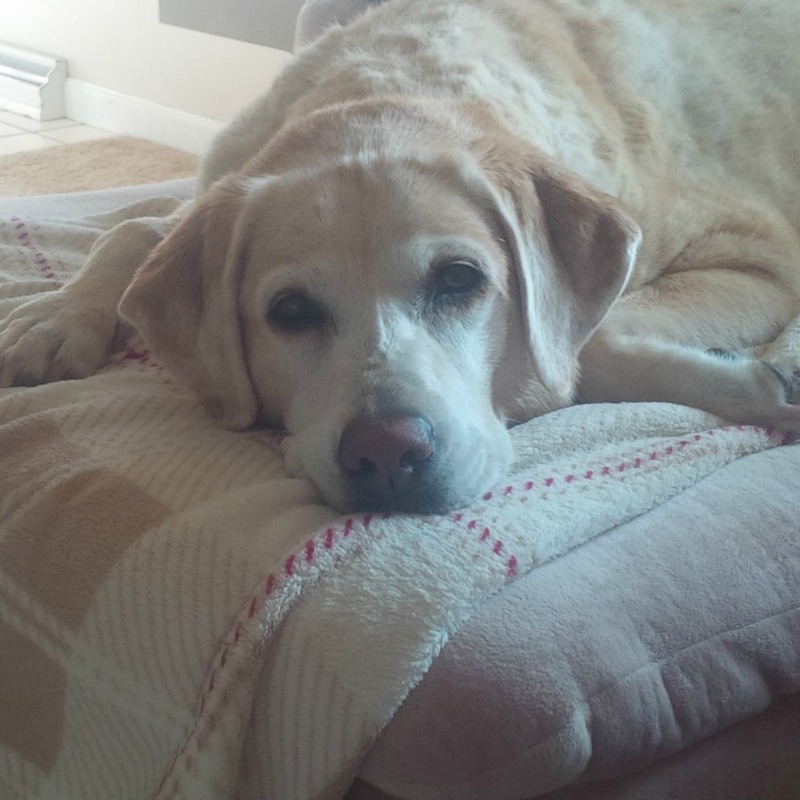 Most of the week was spent dealing with health issues that pertain to Baylee. Do you remember I told you she had bronchitis? Well, it was getting worse and worse. Without getting into everything that ensued, lets just say she now has other health issues. It's always a challenge to get her to take meds but so far its working if I put it in ice cream and top it with pumpkin flavored Chex. I think she's starting to catch on to this trick though because each time she is more and more hesitant to eat the ice cream. I'm gonna need to find another method soon. Sadly my workouts this week only included the gym on Monday and Friday and a 6.8 mile bike ride on Friday. Speaking of Friday, I drove to work and when I got there, there was nobody there. I thought it was weird that there was no traffic and the crossing guard wasn't out. Turns out School was cancelled due to flooding in that county. The weather was beautiful in my county so after I got back to my house I made breakfast changed clothes and went to the gym. They were all surprised to see me there so early. 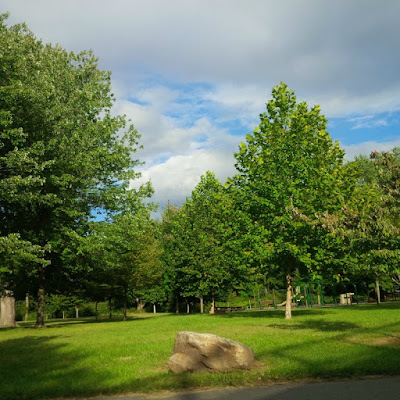 After that, my mom and I took the bikes to the trail. 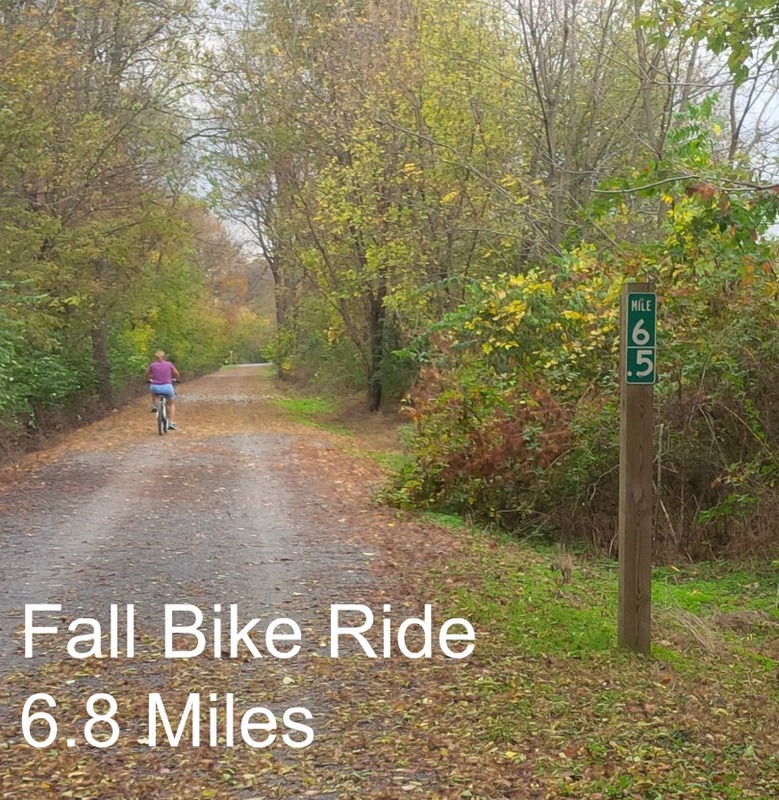 It was a perfect fall ride and the leaves were actually changing colors now. We could have gone further but some dark clouds indicated that we were going to get rain. In other news, we teamed up with Rachel from Running on Happy to host the Friday Five 2.0 link up. Since the original Friday 5 that we participated disbanned, we wanted to continue to give bloggers a place to connect on Fridays. This past Friday was our first link up and I think it went well. We will host it again this coming Friday and the theme will be "free topic" again. I think I'm gonna go with a Halloween theme! Please come check it out. It will go live on Friday Morning. Well that's about it. 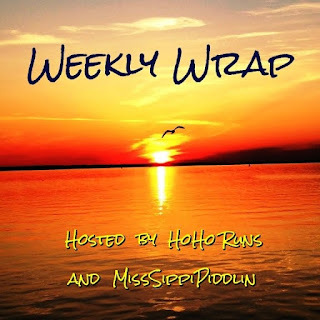 Thanks to Hoho Runs and MissSippiPiddlin for hosting the Weekly wrap! I spend a lot of time on the rail trail. I run and bike there. I mostly run but because I need to take a short hiatus on running I should probably start biking more often! 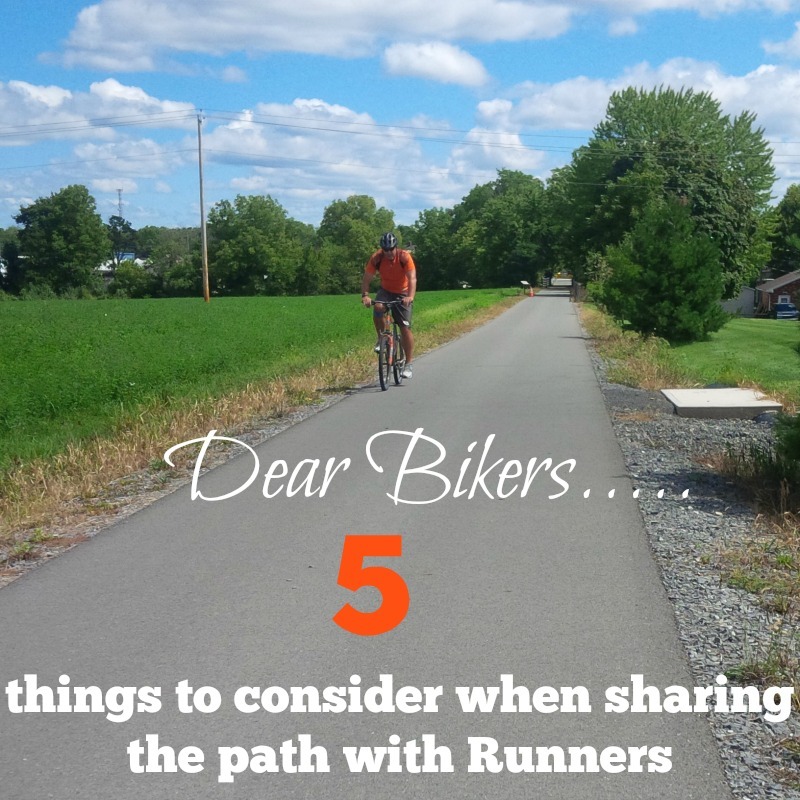 But when I am running it never fails that I encounter bikers (and why not, its a great trail)! Now don't get me wrong, most bikers are friendly and don't mind sharing the path but every once in a wile I encounter one that makes me want to say these things out loud! I would never say them but I certainly think them. 2. If after 5 hot and sweaty miles I am going to work up enough energy to lift my hand and wave or actually say "good morning" you can at least acknowledge me, with a wave or nod or something! 3. As you are passing a runner, don't be afraid to holler out "on your left" so we know you are coming behind us. 4. If we are sharing a narrow part of the path, please consider that the runner may already be exhausted and it may be easier for YOU to move over than it is for the runner (Maybe, I may just be getting lazy on this one). 5.On the same note as above, don't be the path police! Case in point, my mom and I were on the trail together. We were side by side so we could talk, but when a biker would come, one of us would move over. One lady passed us the other day and hollered at us saying "Get in single file"! First of all, we had already both moved over so she had plenty of room . Yea, I admit I did actually say out loud this time "Who are you, the path police?" Too bad it wasn't loud enough for her to hear it! Once again, I do want to stress that most bikers are pleasant, there's just always those select few that make me have these thoughts. Of course I take these things into consideration when I'm on my bike too. 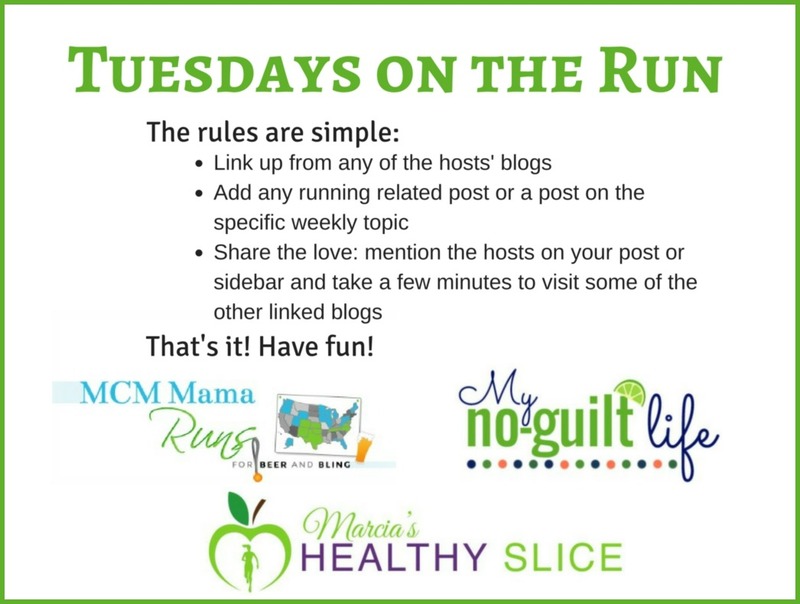 Did you know that Rachel from Running on Happy and us are now doing a Friday Five link up? 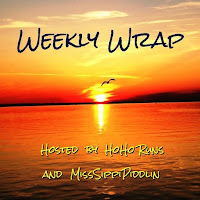 We figured since the previous Friday Five (hosted by the lovely Mar, Cynthia, and Courtney) disbanned, that we wanted to continue to give bloggers a place to connect on Fridays. Feel free to link up below! For this week, don't worry about displaying the badge but we do ask that you post it on further Friday five posts as well as a link back to our blogs. Thanks! When people start a training plan everyone has certain mileage a day or week they plan to run. Like running shoes, people have their preference on what works for them. 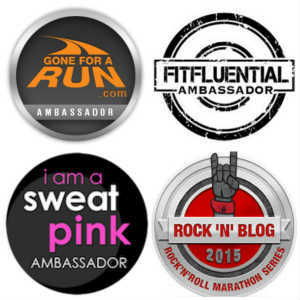 Depending on what kind of race you are training for will determine what type of mileage you do. But when is it not worth it? 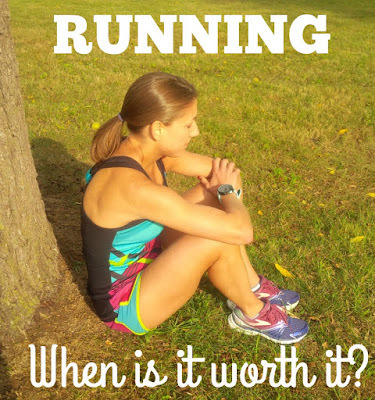 What is the least amount of miles you would need to do to make your run at least worth while? For me personally I think 3 miles is a good number. I feel like I at least accomplished something by running a 5k. But for someone else that may be training for a 5k that may sound like alot. I know many people that are on the running streak that their goal is to run at least ONE mile a day. Kudos for them! Call me lazy but isn't that a lot of work to get up and out the door for just one mile? I suppose it is better than nothing. For me, I don't even feel like I am getting a good workout in until I start breaking a sweat and that is not until a few miles into my run. I asked a running friend this same question. He replied saying 6 miles because he doesn't even feel like he gets in a good groove until midway through a run. To many people that may feel like a long run, but to him he feels like he is just getting out the door to do something. 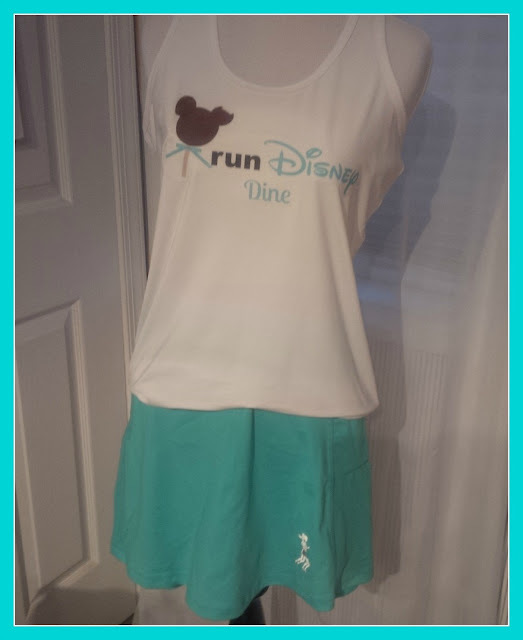 In just 2 short weeks my sister and I will be headed to Disney to participate in the Wine and Dine half marathon. 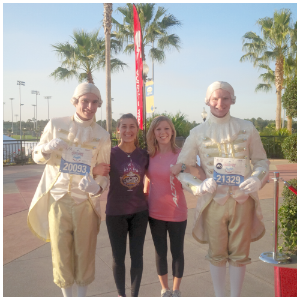 This is the last race on my Run Disney bucket list! If you've been reading our blog for long, you may remember me mentioning that EVERY Half Marathon I've ever run at Disney I have been injured for. No kidding! I was starting to think that maybe Disney was just not the place for me to be running. It didn't bother me that much though because Disney races are run for fun and entertainment anyway. Even though I've had a few niggles here and there throughout 2016, there wasn't anything real serious that had me sitting on the sideline for long. I've been feeling pretty strong during my Wine and Dine training. Although I didn't get as many miles in as I wanted to this summer (because of the heat), I still felt good and was in good shape ( no injuries). 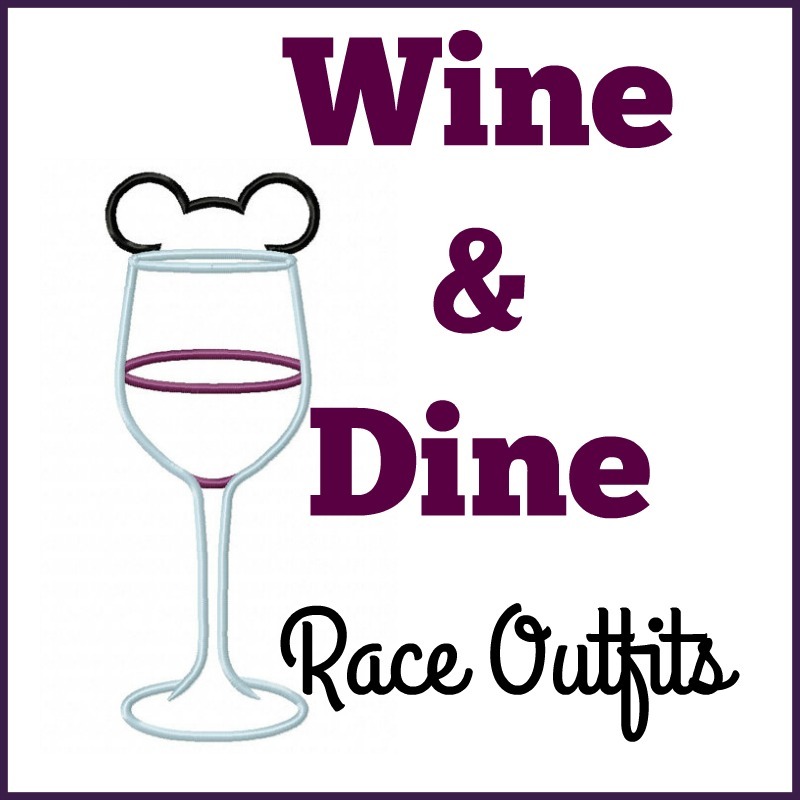 I thought FOR SURE Wine and Dine would be the ONE Disney half marathon that I could pull off without injury. However, as you know I've been struggling with that bruise on my calf. 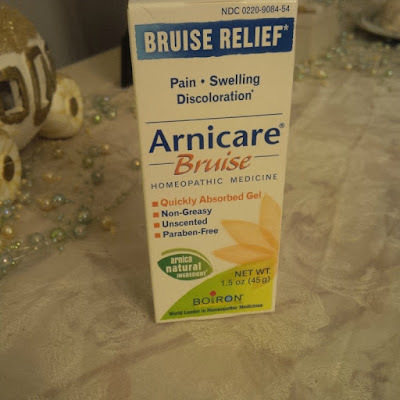 I bought some Arnicare and started seeing the bruise start to fade so I thought perhaps I was on my way to recovery. I felt a knot in the back of my calf the other day and had my PT take a look at it. He confirmed that it was indeed a hematoma and it looked pretty bad. 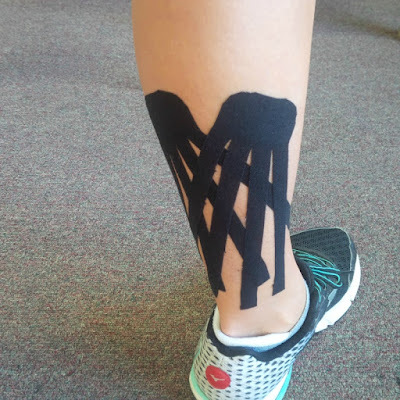 This is how my PT used Rock Tape to tape my Hematoma to see if it would help during my running. Take two pieces of tape, cut in the shape of a jelly fish and then criss cross them over the hematoma. For those of you who don't know what a hematoma is, it is when a blood vessel breaks and blood seeps outside the vessel and pools in one area. Generally a hematoma isn't cause for concern, but mine is in the worst place possible for a runners. So, between Lacey recovering from her awesome BQ at the Chicago Marathon and me still recovering from that HUGE bruise on the back of my calf (are you sick of hearing about that yet?) you can say there hasn't been a lot of running going on here this week. For that reason, I thought I'd take a different twist and mention some of the "little things" that I am thankful for this week because yes, sometimes it is the "little things" that make us smile or just make our day! Thing 1: This one isn't just THIS week, but has been ongoing. I am extremely grateful for the gorgeous weather we are having. Yes, it rained that one weekend, but other than that, the skies are blue and the sun is shining! I have been able to wear my skirts and dresses every day since school started. In fact, there has only been two days were I even needed a jacket in the morning. I figured i'd mention this now because as we enter the middle of October I suspect the chilly weather is going to show up. Although I am loving this weather, i am kind of bummed that I am not out there running in it while it's still nice! Thing 2: I am Thankful to Judy from Chocolate Runs Judy for suggesting Arnicare bruise cream. I was able to find it at my local CVS and have been applying it since Monday. It's always hard to tell if that "something"you apply is actually working or if it's just "time" that is doing the healing. Either way, the purple color seems to be dissipating and it didn't hurt AS much when I did a jog around town on Wednesday ( even though I shouldn't have). Thing 3: This seemed to be the week that people were getting sick. People at work and even in my own household were all coming down with something. I thought for sure I was next. I had the sinus pressure, the sniffling nose, and the sneezing. 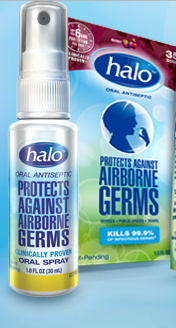 I nipped that in the bud right away by taking Alka-Seltzer Cold and by constantly spraying HALO down my throat. I HATE missing work. I think teaching might be the one job where it takes more work and planning to miss a day than it does to actually show up! Thing 4: If you are a teacher you will know why I am thankful for this next thing. I got a new student yesterday and his last name is at the end of the alphabet. How convenient that alphabetically he is now the last one on my list. This means that I can write his name in my grade book without disrupting the sequence of the class. Like I said, it's the little things! Now if his last name began with an "M", that would have just stressed me out...haha. 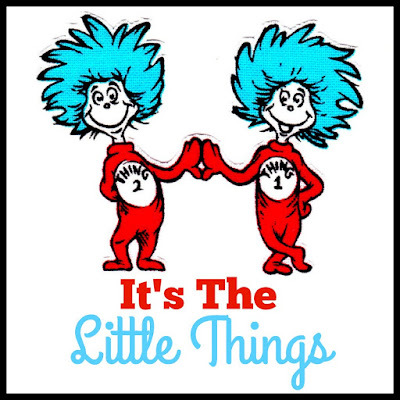 Thing 5: EVERY weekend since school started I have been busy with plans. It's either been birthday parties, anniversary parties, races, traveling, or something. This weekend i am thankful for NO plans. I just want to veg out with Baylee (who seems to be getting over her bronchitis by the way). Maybe I'll do a little more decorating for fall around my house. 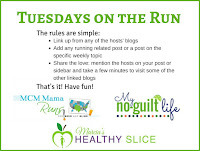 P.S Since I believe this is the last Friday 5, We want you to know that we will be adding you all to our blog reader so we can continue to read your posts on Fridays! We would love if you would do the same. Lets continue to connect! 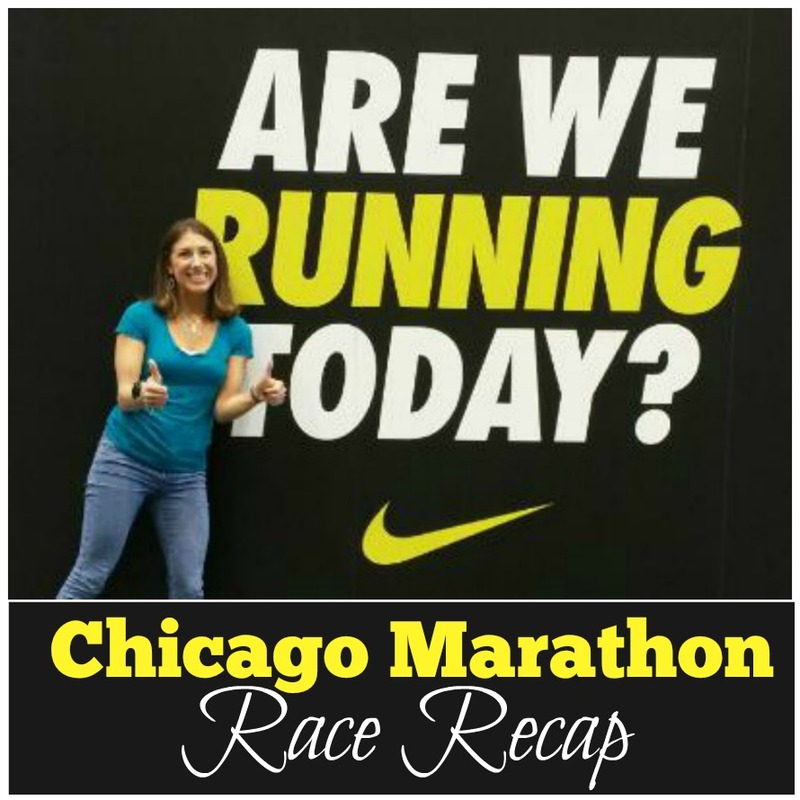 I am back from all the excitement that was the Chicago Marathon this past weekend and am ready to share. If you'd like to see photos from earlier in the weekend please see THIS POST. Now on to Sunday which was race day. The morning started very early with a 4:30 am wake up call. I got dressed and I was out the door by 5 am to head to the VIP hospitality tent which was a mile away from my hotel. I arrived in plenty of time to have a few cups of coffee and a breakfast sandwich. The race director spoke and told us it was one of the best years for the Chicago marathon’s weather since he has been the director of it for twenty seven years and today would be a great day for a PR. 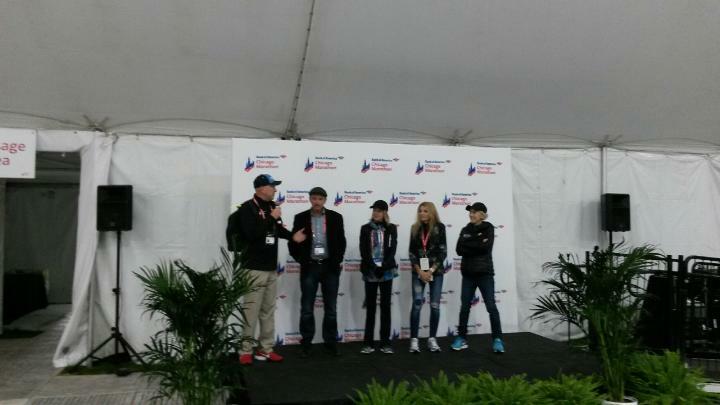 Deena Kastor and Joan Benoit Samuelson also spoke saying that it is a great fast flat course but be careful not to go out too fast. There were also a few other winners from the years past. After they spoke it was soon time to head into our corrals. I wanted to find my pace group right from the beginning, but when I signed up for the race (that felt like forever ago) I wrote a time that was above what I wanted now, and the pace group in my corral did not go down to the time I was hoping for. I felt like I was already behind and the race didn’t even start yet. So I got to the first pacer in my corral which was still 10 minutes and hoped for the best. I started out great like I normally do but knew I was too fast. I was hoping to find the pacer up ahead then I would slow down. But unfortunately I couldn’t find the pacer and knew I had to hold back or I would lose steam. 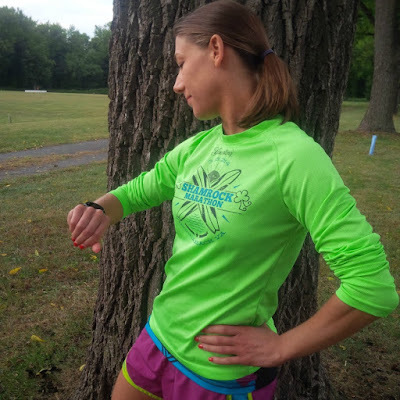 Before the race I found out a way to set my watch so it would alert me if I was going too fast or too slow, and if so it would beep. It kept beeping that I was too fast, so I knew I had to slow down. Also, it was getting very annoying! I finally found a good pace I could hold and set into a groove. My watch wasn’t beeping for a while so I thought I was right in the rage I wanted to be. There was a lady that I came upon around mile 4 and we started running at the same pace for a while. I finally asked her what time she was hoping for. She said anything sub 3:30. I told her my goal was 3:30-3:35 and I wasn’t sure if I was too fast or too slow. She said I may be a little too fast but definitely not too slow. This made me feel good and I was hoping I could keep up with the pace, knowing that there is still a long way to go. There were a few times I wanted to pull ahead and I stopped myself knowing that I wanted to save more energy in the second half. She stopped at a water stop and so did I and we continued on. We just past mile 9 and I felt my headband slipping off. So I went to adjust it and it fell off. I saw it a few yards back and wanted so bad to turn around, but I knew that would be a disaster and plus I wanted to stay with this lady that was keeping me at a good pace. 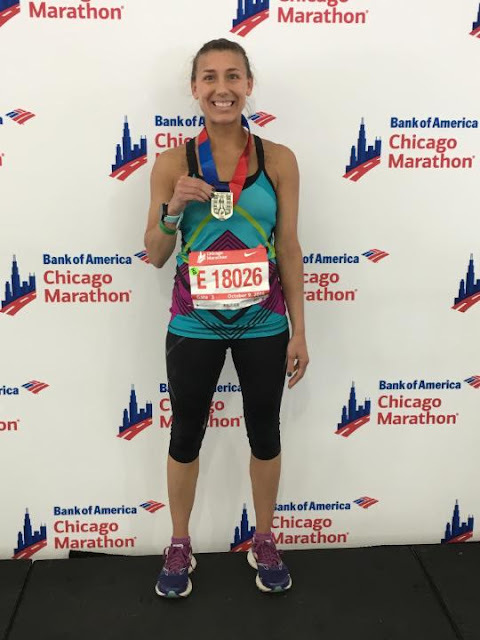 I thought to myself If I get the time I am hoping for it’ll be worth it ( It was even a cute Run Chicago headband so I was a bit bummed) We were still together at mile 11 when we both stopped at the water station but ended up not finding each other. I knew I was still on pace so I continued on. I was very grateful that I had someone for that long. When I arrived at mile 13 I knew my pace and time was still good so I was hoping to maintain it. I was told that Marcia and Wendy were going to be around that mile, not exactly sure where so I took one of my ear buds out just in case they saw me and would yell for me. But unfortunately I didn’t see them with the huge crowds that were spectating. The next few miles were kind of a blur. I was just jamming out listening to my music and keeping an eye on my pace. I had a time I wanted to get to by mile 20, and I made it. After that, I knew I was on the home stretch and still continued holding my pace. By mile 24 my Ipod died but the energy of the crowd was huge and music was playing so I just took it all in and enjoyed my last few miles. I kept seeing signs that said 800 yards, 400 yards, 200 yards, then I finally saw the finish line and gave it all I had to the finish. When I finished I knew my watch was about ten minutes behind the clock. But still wasn’t sure my exact time. I knew I PR’d but by how much? Did I BQ? I may have, but was I under enough? I received my medal and continued down the finishing shoot to head to the VIP area. I received my complimentary massage and it felt heavenly! While I was getting a massage my friend came over and congratulated me. In addition to a 15 minute PR. I BQ’d.....Yay! I needed a 3:35 and I came in at 3:332:03. I definitely am not a squeaker; I just hope that it is enough. I guess I will find out in 10 months. Until then I can just enjoy my accomplishment! After my massage, I grabbed some lunch then I had to head back to hotel because check out was soon. After I showered and packed, I checked out of the hotel, but luckily they were able to hold my luggage. My friend and I walked down to the Nike Store because they were doing free medal engraving.